ClassI– corresponds to a loss of up to 15% of circulating blood volume (CBV). At the same time, the clinical symptoms are absent or there is only orthostatic tachycardia (heart rate when going from a horizontal position to a vertical increases by 20 or more bpm). Class II–corresponds to a loss of up to 25% of CBV. Its basic clinical sign is an orthostatic hypotension or decrease in BPby 15 or more mm Hg when going from a horizontal position to a vertical. Class III – corresponds to a loss from 30 to 40% of CBV. It occurs as hypotension in the supine position and oliguria (urinary volume is less than 400 ml/day). Class IV – loss of more than 40% of CBV.Characterized by collapse (extremely low BP) and alteration of consciousness up to the coma. For successful first aid, classification depending on the nature of the damaged vessel is of great importance. Occurs from the arteries containing oxygenated blood. Lead to the rapid loss of large amounts of blood. Arteries have an expressed muscular membrane which can be spasmedwith injury. Its source is the venous vessels. These vessels do not contract with injury, however can stick together, as their walls are thinner, and the diameter is larger than those of the arteries. Bleeding is slow, but profuse. The blood flows from the small vessels, predominantly of the skin and mucous membranes. Blood loss is usually insignificant, although it can be profuse in a large wound. Bleeding from the parenchymal organs of the body: liver, spleen, kidneys, lungs, and pancreas.This type of bleeding usually occurs during surgery. This is a mixed bleeding whichalso can be observed with extensive injuries of the limbs. Hemostasis is a physiological reaction of the body aimed at maintaining the liquid state of the blood, as well as preventing and stopping bleeding when the integrity of the vascular wall is compromised. Normal duration of bleeding is 3 minutes; the coagulation time is 2-5 minutes (according to Sukharev), 8-12 minutes (according to Lee-White). 1) local narrowing of the lumen of blood vessels (to reduce the blood flow to the site of injury) – Fig. А. 2) formation of the platelet “plug” –Fig. С.
Secondaryhemostasis(plasma coagulation), being the interaction between clotting factors and inhibitors. Fibrinolysis: the process, as a result of which the clot dissolves after the integrity of the wall of the damaged vessel is restored – Fig. 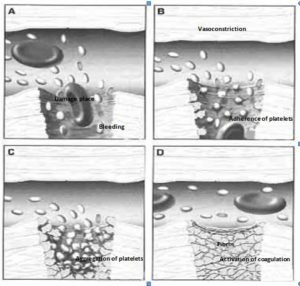 D.
If the integrity of the blood vessel is impaired, the formation of a platelet “plug” closing the damage (primary hemostasis) is the first step required to stop bleeding. Basic active components of the blood involved in this process are platelets and fibrinogen. When they interact, a platelet “plug” forms and the bleeding stops. The launch of a cascade of reactions involving clotting factors leads to the formation of a fibrin network that stabilizes the platelet “plug” and finally stops the bleeding (secondary hemostasis). This process consists of a series of chemical reactions involving various plasma components. Complex interactions lead to the transformation of the soluble fibrinogen protein into an insoluble fibrin protein which forms a clot body. Then, wound healing eliminates damage and initiates the third stage of hemostasis – fibrinolysis, i.e., dissolution of the clot. The final stop of bleeding at the site of damage to the vessel occurs after the formation of the clot which is located outside the lumen of the vessel.